Janie Bones digs deep to stop Baker's Shovin'. Photo courtesy of John Jamieson, JaJa Photography. 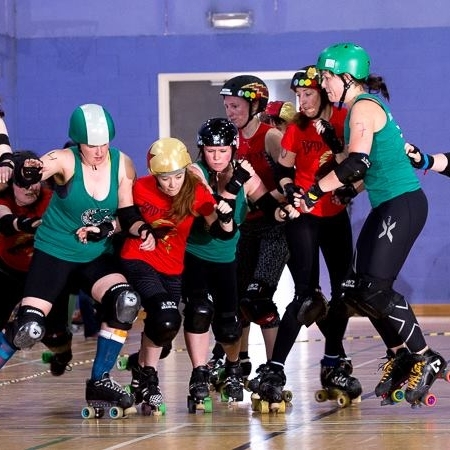 Not only did we have the Stefanie Mainey bootcamp this past Sunday but we also hosted an excellent game against Blackpool Roller Coasters on Saturday - what a JAM packed weekend! Blackpool travelled to us with a handful of guest skaters from their neighbouring leagues to play our all-new Maiden Grrders roster. 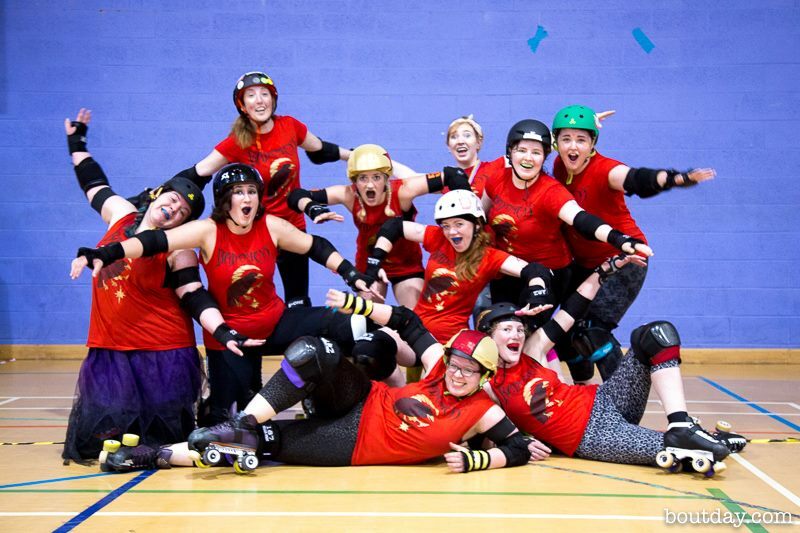 Both teams were excited to take to the track on Saturday afternoon, and none more so than our newest Maidens: Penny Pinch'er, StarGrazer, Puma Thurman, Bruise Missile and Phylociraptor who all donned their yellow jerseys for the first time. Both teams were well matched at the beginning and traded points for the first few jams. The Coasters hit HARD, though the Maidens held their own with great teamwork and offence. Blackpool suffered from several penalties early on and Glasgow started to pull away. By half time the score was GRD 97 - 76 BRD. Despite their hard hits and their jammers' best attempts to juke around the Maidens' walls, a few foul outs reduced Blackpool's chances further and left them with a very short roster. For the last ten minutes they played with just five skaters available to line up! However their spirits stayed high throughout and they fought a great game right to the end. GRD would like to thank all the officials, volunteers and events staff who helped the game happen - we couldn't have done it without you! We would also like to thank Blackpool (and guests!) for travelling to play us and for being such excellent opponents. We're already looking forward to a rematch in the future! Maidens vs Roller Coasters. Photo courtesy of John Jamieson, JaJa Photography. Missed the game? Make sure you don't miss out next time by picking up your tickets for the Home Teams Season Opener here now! Two games for the low low price of £6 in advance, with all your favourite Glasgow skaters pitting their wits and their wheels against each other. We can't wait for June 18th!